Sputnik Planitia, a 1,000-kilometer wide basin within the iconic heart-shaped region observed on Pluto's surface, could be in its present location because accumulation of ice made the dwarf planet roll over, creating cracks and tensions in the crust that point towards the presence of a subsurface ocean. Published in the Nov. 17 issue of Nature, these are the conclusions of research by James Keane, a doctoral student at the University of Arizona's Lunar and Planetary Laboratory, and his adviser, assistant professor Isamu Matsuyama. They propose evidence of frozen nitrogen pileup throwing the entire planet off kilter, much like a spinning top with a wad of gum stuck to it, in a process called true polar wander. "There are two ways to change the spin of a planet," Keane said. "The first—and the one we're all most familiar with—is a change in the planet is a change in the planet's obliquity, where the spin axis of the planet is reorienting with respect to the rest of the solar system. The second way is through true polar wander, where the spin axis remains fixed with respect to the rest of the solar system, but the planet reorients beneath it." Planets like to spin in such a way that minimizes energy. In short, this means that planets like to reorient to place any extra mass closer to the equator, and any mass deficits closer to the pole. For example, if a giant volcano were to grow on Los Angeles, the earth would reorient itself to place L.A. on the equator. To understand polar wander on Pluto, one first has to realize that unlike Earth, whose spin axis is only slightly tilted so that the regions around the equator receive the most sunlight, Pluto is like a spinning top lying on its side. Therefore, the planet's poles get the most sunlight. Depending on the season, it's either one or the other, while Pluto's equatorial regions are extremely cold, all the time. Because Pluto is almost 40 times farther from the sun than we are, it takes the little ball of rock and ice 248 Earth years to complete one of its own years. At Pluto's lower latitudes near the equator, temperatures are almost as cold as minus 400 degrees Fahrenheit, cold enough to turn nitrogen into a frozen solid. Over the course of a Pluto year, nitrogen and other exotic gases condense on the permanently shadowed regions, and eventually, as Pluto goes around the sun, those frozen gases heat up, become gaseous again and re-condense on the other side of the planet, resulting in seasonal "snowfall" on Sputnik Planitia. This animation shows how Pluto reoriented in response to volatile ices filling Sputnik Planitia (the left lobe of Pluto's "Heart"). Sputnik Planitia started northwest of its present position, and as it filled with ices, the tides from Charon (Pluto's largest moon) caused the entire dwarf planet to reorient, and align Sputnik Planitia with Pluto's tidal axis (the line running through Pluto and Charon). If Sputnik Planitia is still accumulating ice, then Pluto may still be reorienting. Credit: Animation by James Tuttle Keane. Maps of Pluto and Charon by NASA/Johns Hopkins University Applied Physics Laboratory/Southwest Research Institute. "Each time Pluto goes around the sun, a bit of nitrogen accumulates in the heart," Keane said. "And once enough ice has piled up, maybe a hundred meters thick, it starts to overwhelm the planet's shape, which dictates the planet's orientation. And if you have an excess of mass in one spot on the planet, it wants to go to the equator. Eventually, over millions of years, it will drag the whole planet over." In a sense, Pluto is a (dwarf) planet whose shape and position in space are controlled by its weather. "I think this idea of a whole planet being dragged around by the cycling of volatiles is not something many people had really thought about before," Keane said. The two researchers used observations made during New Horizons' flyby and combined them with computer models that allowed them to take a surface feature such as Sputnik Planitia, shift it around on the planet's surface and see what that does to the planet's spin axis. And sure enough, in the models, the geographic location of Sputnik Planitia ended up suspiciously close to where one would expect it to be. If Sputnik Planitia were a large positive mass anomaly—perhaps due to loading of nitrogen ice—it would naturally migrate to Pluto's tidal axis with regard to Charon, Pluto's largest moon, as it approaches a minimum energy state, according to Keane and Matsuyama. In other words, the massive accumulation of ice would end up where it causes the least wobble in Pluto's spin axis. This phenomenon of polar wander is something that was discovered with the Earth's moon and with Mars, as well, but in those cases it happened in the distant past, billions of years ago. 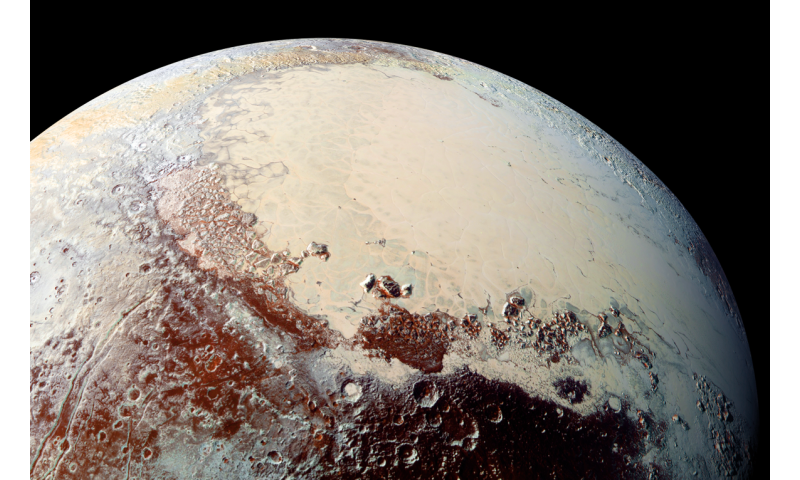 "On Pluto, those processes are currently active," Keane said. 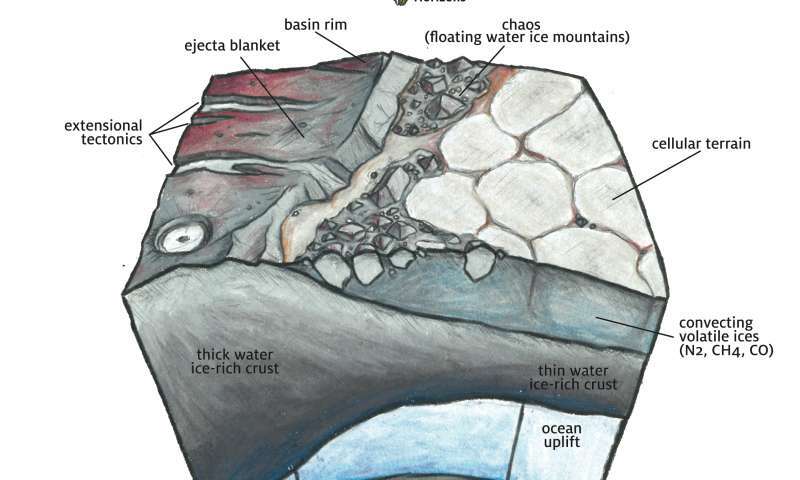 "Its entire geology—glaciers, mountains, valleys—seems to be linked to volatile processes. That's different from most other planets and moons in our solar system." And not only that, the simulations and calculations also predicted that the accumulation of frozen volatiles in Pluto's heart would cause cracks and faults in the planet's surface in the exact same locations where New Horizons saw them. The presence of tectonic faults on Pluto hint at the existence of a subsurface ocean at some point in Pluto's history, Keane explained. "It's like freezing ice cubes," he said. "As the water turns to ice, it expands. On a planetary scale, this process breaks the surface around the planet and creates the faults we see today." The paper is published alongside a report by Francis Nimmo of the University of California Santa Cruz and colleagues, who also consider the implications for Pluto's apparent reorientation. The authors of that paper agree with the idea that tidal forces could explain the current location of Sputnik Planitia, but in order for their model to work, a subsurface ocean would have to be present on Pluto today. Both publications underscore the notion of a surprisingly active Pluto. "Before New Horizons, people usually only thought of volatiles in terms of a thin frost veneer, a surface effect that might change the color, or affect local or regional geology," Keane said. "That the movement of volatiles and shifting ice around a planet could have a dramatic, planet-moving effect is not something anyone would have predicted." The authors contrary evidence inputs in a failed speculation about the structure of Pluto. In equation does introduced again the water but do not offer proof: from where water, as they accrue, which are the processes responsible for the formation of water and most importantly which the evidence points on such an enormous amount of water. If there is a heat source, that source should be appointed and provide evidence that this process is possible. Science Pluto is so far gone in the right direction, science not need this kind of not scientific speculation.